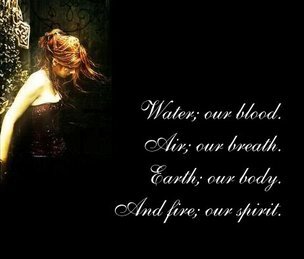 When casting a Magick Spell, every word, action, and thought becomes part of the spell. Every spell should have a verbal component of prayers, chanting, songs or rhymes. The power of words in magick is profound, words convey power and intent. Words can create reality where none existed, their sounds and syllables are thought to possess their own inherent power just like herbs and stones. The connection between words and magick is due to a belief in the inherent ability of words to influence the universe. Using Words of Magick in your spells should never make you feel uncomfortable or foolish. If the spell you're using has words that make you feel self-conscious, change the words. Many spells use archaic language intended to enhance the magickal ambiance. If using "thees" and "thous" isn't for you, go ahead and change the wording to modern English. Many spells use rhymes; they're easily remembered when the spell requires you to chant or repeat the incantation at intervals. Rhymes also free you from reading or trying to remember paragraphs of words, allowing your mind to enter the magickal meditative state that is so important when performing magick. Our normal waking minds block out the unseen energies surrounding us that are needed in magick. It is very important that the words you are using in your spell express the desire of your goal accurately, precisely and without ambiguity. Magick requires laser-beam intent, nebulous longings will get you nowhere. In order for you to bend reality towards the goal you have in mind you must be clear on exactly what you want to achieve. There are several ways to actually speak your spell. Clear, precise, articulation of words are used to announce intention and desire to the universe or to a specific Deity or power. In this case your words should be spoken with passion and volume. Chanting may be done in a monotone voice, prayers said with passion and rhymes may be spoken in a sing-song voice. Sometimes the verbal components of your spell aren't meant to be understood by others, and the words are muttered or murmured The words of a spell may also be transferred into something physical such as food or water, then given to another to eat or drink.